When it comes to restaurant serving trays and stands, we have you covered. We have been selling tray stands for dining room table serving for over 40 years. Most fine dining restaurants use serving tray stands next to your table to stage all of the meals for easy serving and recognition of who gets what. Tablecraft Chrome Double Bar Tray Stand - 29.5 in. Tablecraft Teak Wood Tray Stand - 32 in. Tablecraft Metal Single Bar Tray Stand - 29.5 in. Update International Crome Plated Pizza Tray Stands - 9 in. x 8 in. x 7 in. 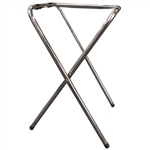 Update International Chrome Plated Tray Stands - 37 in. Buy wholesale Tray Stands for your dining room from the restaurant supply superstore.